This is what most of last week looked like around here. First Seth came down with the stomach flu and then the next day the girls had a brief turn and now we are battling coughs and runny noses. But spirits are better and lessons can be done. Nancy from Sage Parnassus listed a cozy winter book list and inspired me to make a list of wonderful winter books too. I won't duplicate the titles she already listed, so please make sure to check out her list. And please let me know what other books you enjoy in winter as well! * I am reading Jan Karon's At Home in Mitford again because I saw an extra paperback copy on my mother's bookshelf and thought I'd borrow it since I gave mine away to someone who was supposed to be on bedrest for a difficult pregnancy. I doubt the person read it, but now I get to enjoy the hunt of getting another copy or two. I have most of the collection in hardcover, but paperbacks are comfier to hold, even if they are not as beautiful as their more rigid counterparts. Oh I how love her writing style. Even though I know the story, I get caught up in it anyway. * I am also reading Ten Ways to Destroy the Imagination of Your Child by Anthony Esolen and have asked two close friends to buy it and read it with me so we can talk about it together however we can. I have good friends like that who will buy books because I ask them to, although admittedly I'm not as likely to return the favor. * I am also in the middle of some other sets of older books by Michael Phillips and Judith Pella, collectively called The Stonewycke Trilogies that I also took from my mother's bookshelves. Really I shouldn't be left alone with other people's books. I have read them all at least twice since I am a teenager, but do you think I can remember the storyline? There are six books total, which form two trilogies but follow the same family tree. I finished the first set and then Mitford beckoned and the rest of the set awaits. If all I read was fiction, my reading lists would sound a bit more impressive, but throw in all the non-fiction I read and it feels like I barely make progress on my shelves. * Speaking of non-fiction, I am in the middle of Sheldon Vanauken's Under the Mercy, Michael O'Brien's A Landscape With Dragons, Tracy Lee Simons, Climbing Parnassus, and ah, yes, several others too numerous to mention. And the library notifications keep coming in for books I've requested. Many of those I just peruse though to see what they are like. Some immediately go on my wish list, others go immediately back to the library. * My kids have been sick this week, so all my lesson plans went downhill after Monday in which I had satisfactorily checked every item off only to wake up Tuesday to find out that some stomach bug germs had invaded our home. On the positive side, most of my lesson plans for next week are done, so I don't have to spend as much time this weekend on them. Of course, Shane and I are waiting to see if we succumb to some version of the sickness, so perhaps I will need to come up with another positive side Monday morning. * Over the Christmas break, Shane and I went away for two nights at the same Inn we spent our honeymoon more than a decade ago. By the second day, I was getting used to not having some aspect of childcare or housework to do, and by the morning we were to return to the kids, I wondered what on earth I would do with my time if we did not have children or if we did not homeschool them. What a different life we would have, indeed. All of the photos are from the grounds of the Inn. * After drinking more coffee in the last few months than I have drank my whole life, I'm back to tea, three times a day, two cups of regular Lipton and usually one of my Stash teas after dinner. I'm not counting the cup of coffee I hurriedly drank this past Sunday at church in my classroom before the rest of my Sunday School students showed up. Kate and Laura were already there of course with me and it seemed like coffee in a styrofoam cup was the most expedient way to help me remember why I signed up to do this year after year after year. It's fun for sure, that particular cup of coffee just helped me get through the fun. Heh. Turning back to the tea discussion, my most recent Stash variety is the Black Forest which has a hint of cherry and strangely enough, a woodsy scent. Who knew that the tea name really was that literal. * A seed catalog from Terra Edibles arrived in the mail last week and I've already started my order list. I know its only January, but thinking and planning helps keep the winter blues at bay. *The first day the kids were sick, it was just Seth, so while he rested and the girls played, I went on a baking spree with cookies and homemade bread. The cookies were Snickerdoodles and by the time I went to bed, I had eaten so many I really did lose count. But after the first batch which I let in the oven a minute too long which made them slightly more dry than I like, I carefully monitored the rest of the trays and practically tasted one off each tray and then a few more after dinner with my dessert tea. The rest went in the freezer and promptly came out one bag at a time, one day at time. I just took the last bag out this morning to thaw. I put them in small bags, but really they are just too good to last much longer. I keep thinking I should get another batch going since the butter is already softened, but now I'm afraid to. Even Shane, after wrinkling his nose over the unfamiliar name of the cookie, handed the bag back to me after eating several, cautioning me that he might eat the rest of the bag if he held on to them much longer. When I reclaimed the bag to help preserve his waistline, the now very light bag only had two lonely cookies staring up at me. And the cookies were small, how much damage can they do I argue calmly with myself. That's the way home baking is, the stuff tastes so good, it scares you. Don't ask me how many banana chocolate chip muffins I eat the day I make them. Usually two and then I remind myself they will still be there in the morning. That's not scary at all, that's worth getting out of bed for, right after the children of course. As soon as I read this, I immediately thought of Charlotte Mason's No. 12, Education is the Science of Relations. Making connections with the rest of our existence is what brings a cohesive understanding of the world in which we have been created for. And when you happen upon yet another one of these connections and realize its significance, there is inevitable delight and wonder as you experience even more order in God's universe. 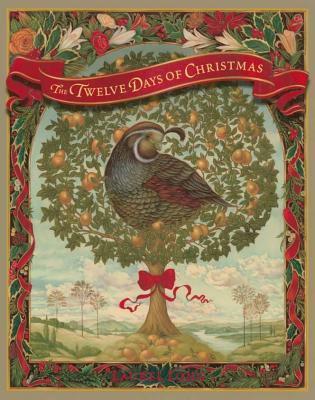 This gorgeous book based on the popular Christmas folksong was new to me while browsing our library's system for Christmas books. It is probably one of the most beautifully illustrated books I ever seen. I plan on owning our own copy in time for Advent 2014. Rich colorful details, classy and elegant designs, it is a keeper to treasure. High praise for this book. 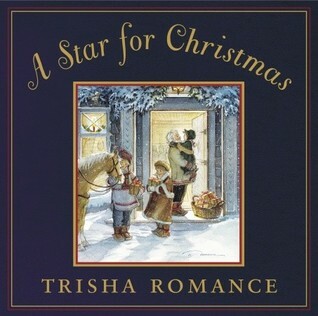 I was first introduced to Trisha Romance and her artwork by a friend in New Brunswick who was slowly building her own collection of Trisha Romance artwork. I loved looking at the pieces she had displayed in her home and I became familiar with her signature style. It was in Christmas 2012 that I first saw this book listed on our library's site, so I immediately requested it and waited for it to come in. It is a beautiful book that makes you want to step right into the pages and be part of the scenes. The story is wonderful, although I admit, I usually have serious hang-ups with sappy Christmas books, but this time I told that part of my personality to be quiet and go away so I could enjoy this one to its fullest. It is full of outstanding artwork that makes you linger over each page, savoring the images and noticing the details. I think this was another serendipitous library find. I have read other books by her, so I thought I would give this Christmas picture book a try. Shane actually read it aloud to the kids and I didn't get to hear all of it, so I finished reading it on my own before it had to go back to the library, wondering how predictable the story would be. I was pleasantly surprised by the ending and thought it was quite touching. The illustrations are wonderful and envelope the whole page. An excellent addition to the Christmas book stack. This actually belongs on last month's list but I forgot to include it. I read this on my own before giving it to Seth to read the week we discussed The Crimean War. It is larger than a traditional chapter book and has maps, illustrations and black and white photographs on almost every page of text. This is not just the story of Florence Nightingale, this is also the story of her world and I enjoyed it so much. Everything I would write about her story seems to make it sound cheapened somehow, her family's opposition to her nursing studies, her depression over their opposition, eventually gaining their approval and being sent to the Crimean War front upon completion of her studies, facing opposition from doctors and military personnel, drawing up blueprints for improved facilities and sterilization practices and on and on and on went her story. I imagined that she must have known of or been known by Charlotte Mason so I checked the Charlotte Mason digital archives and there was a letter from a colleague of Florence Nightingale(who was also an acquaintance of CM) to a public figure that ended up in Charlotte Mason's boxes of papers. Not the solid connection I was looking for, but a connection nonetheless. Anyways, this is a great read and I highly recommend it. This is the second Mr. Pipes book we have finished together as part of our Morning Time and we enjoyed learning about the different Psalms and Hymns written in the Reformation era. This time, Mr. Pipes, Drew and Annie traveled to Germany and Switzerland as they visited areas made familiar by Martin Luther, John Calvin and others. I did not know many of the songs presented in this book but since author Doug Bond always includes the sheet music, I can read the music and learn it. We will likely start another Mr. Pipes book on American hymnwriters in the new year. Again, this is the second Swallows and Amazons book that we have finished and we love these stories! (Our first was Swallows and Amazons.) Yes, there is a lot of sailing jargon, but keep with it and you are rewarded with memorable lines and references and of course, a great story line. We have already picked out Winter Holiday as our next title to read starting in January, but I almost feel like starting it now! Canon Press had a sale back in the fall(need I say more?) so I picked up this slim paperback along with several other titles and this is the only one I have finished to date. And that is certainly because it is a fast-paced read, but I'd have to say, too fast-paced for me to remember and practice everything he suggested. I did write a short limerick soon after reading it, my first I think, at least in my adult years, (not counting my scavenger hunt clues I write for our son's birthday parties)so I must have put some of his ideas to use right away. It's called The Nightlight and it's based on mostly true events and it's mostly terrible after the second line, but it's terrible fun nonetheless. So did the shin that I just bark'd. I keep changing it, but it doesn't seem to get better. I'm only posting it, because the five of you reading this have a good sense of humor and can laugh along with me. Please do not judge the book based on my poor attempts. I'm certain Douglas Wilson's tips can inspire much better material from its other readers. Anyways, that's what happens when you tell people to practice writing stuff. They listen. I can't seem to remember whose blog or website I saw this book listed on earlier in December, but I checked and our local library had a copy available. 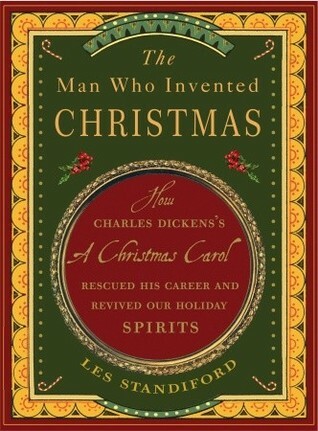 As someone who didn't know very much about Charles Dickens prior to this book, it gave a lot of interesting biographical information along with the background story of the writing of A Christmas Carol. 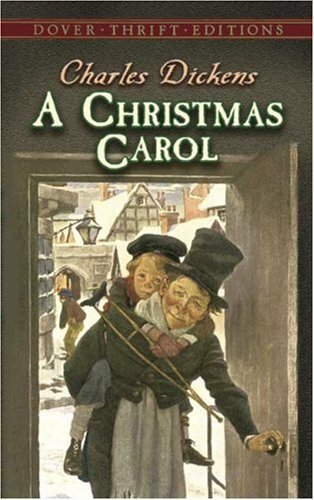 And since I had just finished reading A Christmas Carol for the very first time, it was all fresh in my mind as I read this book. My friend, Kathleen loaned me this book after I loaned her a Wodehouse book and she found more of them at her parents' cottage. Earlier in December, I posted a funny quote from the book under my random Reasons to Love Wodehouse posts. It was a great read, and made for some good moments of quiet chuckling as the absurd becomes the expected. This is my fourth or fifth Wodehouse novel over the years and they are always worth a good re-read. Reading through this book for the first time was a real eye opener into the expressions and characters that have become part of our literary and holiday culture. I enjoyed the descriptive phrases and passing observations made by Scrooge while being escorted around by the various ghostly visits. 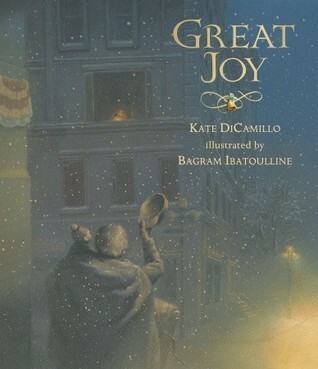 I can see myself wanting to read this each year around Christmas time and enjoy it all over again. I don't normally include movies, because I don't watch that many, but here are two that I watched in the last two months and quite enjoyed. Mr. Holland's Opus with Richard Dreyfuss. Richard Dreyfuss is an incredible actor and this movie really showcases him at his best. Moving through the decades of music as a high school music teacher, I thought about this movie a lot for several days after I watched it. Yes, it's an older movie now, but one I had never seen, so I requested it from the library after seeing it mentioned in one of Mama Squirrel's posts. We have a copy of this book and we read it for the first time last Christmas and found some favorite parts to laugh about and remember for this year. I knew there was a movie made but without knowing much about it, I was hesitant to buy it. A quick search on youtube and I found the whole movie posted which I immediately started to watch. Ten minutes in and I knew Seth would love it. I ordered it right away from amazon.ca and it shipped quickly. We watched it together and laughed our heads off and Seth planned another showing for Christmas Eve which we did. A completely wholesome movie about a young boy's Christmas in Wales from yesteryear as recounted to his now grandson eagerly waiting his own Christmas morning complete with snow. A really wonderful and fun movie to enjoy together as a family. Resuming our home routines today after the holiday break was enjoyable, more so because on Saturday afternoon after unpacking our bags and tidying the house, I took time while the girls napped to make out my lesson plans for this week. It really makes or breaks my week if I have almost every detail planned out. We have so many different avenues we spend time on, so many interests we talk and learn about, so many ideas for play, our day does not suffer from being dull, although it can feel overwhelming at times. Today we resumed our Training Hearts, Teaching Minds catechism questions, reviewing what is justification and starting what is adoption. 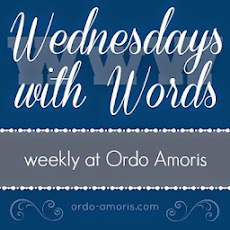 We picked up our Bible reading in the middle of 2 Samuel and forced our memories to recite more than half of Psalm 145. We sang out of our hymn books and read aloud some poems. We prayed. We started a new nature calendar for the month of January and started the first half of Naming Nature with January, since we already completed the second half when we started in September. We read aloud about Chile, Bolivia and Peru fighting over mining rights in the driest desert place on earth in the mid 1800s. We learned about the building of the Suez Canal and discussed how debt caused the Egyptian government to lose control of the canal to Great Britain and the biblical problems with debt. Seth gave loose narrations of both events. We took a break for lunch and after the girls were settled for a quiet time/nap, we reviewed previous prepositional phrase lessons in our First Language Lessons, Level 4 grammar book and reminded ourselves how they are diagrammed especially when there are more than two in a sentence along with a direct or indirect object thrown in for fun. We dug back into our All About Spelling lessons by finally starting Level 6 with some much needed review about why English words do not end in the long o sound of spelled -oa and when to use the /j/ spelling of -dge. We practiced syllabification rules and discussed again how the r controls vowels in syllables. We laughed at how easy it is to come up with homophones and word riddles in the English language because we have such a rich vocabulary. We read again about King Alfred and the Cakes in our Classical Writing books and Seth asked what ill-natured meant. We re-wrote a statement sentence three times from the story in order to make into a question, a command and an exclamatory sentence. That is always fun. We re-wrote a dialogue sentence from the story to use two other types of utterance words. Our sentence was "You lazy fellow! ", she cried. Seth re-wrote it to say, "You lazy fellow! ", she howled and "You lazy fellow! ", she shouted. Again more fun with words and more fun for me because I pick out what we can do with the story. And we finished our lessons with going over a portion of a Lingua Latina test that we both struggled through many weeks ago. And we encouraged ourselves that we gave more correct answers this time, with perhaps only a few concepts to work on before we go to the next chapter. I have found for me, Latin is a puzzle that if I give my time to study it, I can figure it out, but it is not a pick-up-and go subject for me. I must soak my mind in it in order to solve and understand its grammar and usage. We decided to wait on starting our third Swallows and Amazons title, Winter Holiday since it was already 4:30 in the afternoon. It was a good day, even if the girls' play made our house temporarily look like every cupboard, shelf and basket had exploded inside our home. But a quick tidy and all was mostly well again. Finding homes for their new toys and belongings is the challenge for this month but bringing order is part of what we are doing here at home. Seth did not complete any independent work today like typing, map-drawing, reading and narrating from various non-fiction books, copywork, etc. But I also did not work with either of the girls today, so tomorrow is another day for more time together, even if we are sometimes doing different things.